For jazzbos, "Satch" refers to Louie Armstrong. 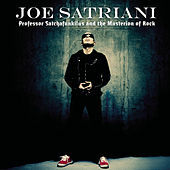 But for axe masters around the world "Satch" is Mr. Joe Satriani, a dude worshipped for fusing Jeff Beck-inspired wizardry and instrumental hair metal. He continues that approach with Professor Satchafunkilus and the Musterion of Rock. Sure, that title sounds like an old Parliament jam, but no worries â this album's loaded with nothing but finely chiseled hot licks grafted to sturdy pop metal. He even stole Frampton's talk box for "I Just Wanna Rock."